My brother Seth is coming home in a week! I can't even believe that the two years he has served a mission in Oregon for the LDS church are almost over! I am SO EXCITED! I thought it would be fun to make t-shirts (graphic tee style) to wear to the airport when we pick him up. My mom doesn't like to be a spectacle so I'm making her a tote bag instead of a shirt. Here's what I've done so far. 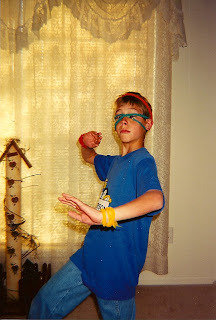 Seth was WAY into Power Rangers at the time. I used this tutorial and posterized the image in Photoshop. I used two posterizing levels instead of the default of 4. 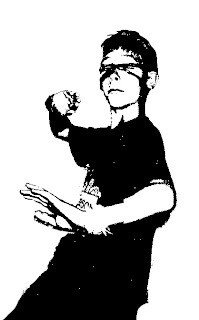 Then, I enlarged the image taped it on top of a couple of sheets of freezer paper and cut out the black areas with an X-acto knife. I left little tabs connecting to the floating inside pieces and later cut them out after I'd ironed part of the floating piece down. 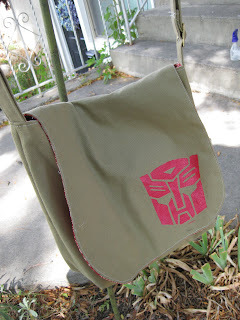 Next, I painted in the stencil using fabric paint. On the nieces' and nephews' shirts I plan on writing "Say Uncle!" The brothers' and sisters' shirts will say "Oh Brother." I want to do the letters like this shirt on Flickr. I'm having trouble deciding what to write on my mom's tote bag and what will probably end up being my dad's apron. Any suggestions? Maybe "He gets it from HIS/HER side of the family." Those look amazing. You are such a great sister. AAAAAh! You never cease to amaze me! This is awesome! I LOVE the shirts. Congrats on getting to see your brother soon - that is awesome! lol this is so cool n funny lol..
n u are a great sister! im so late to see this..but i just had to comment!